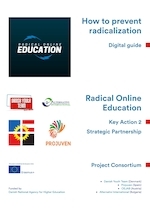 The present digital guide provides youth workers with updated knowledge, tools and examples of good practices in the field of preventing online radicalization. 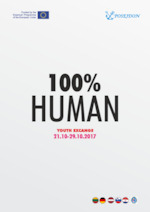 The booklet 100% Human made the project participants. The booklet is intended for anyone who wants to use workshops, exercises or other methods and tools used in the project. The “Impact Plus Guide” is designed to provide a valuable resource to youth workers for an effective project management. The Guide ensures the sustainability of the project results as well establish a list of recommendations and good practices. The manual includes outlines of games for entrepreneurship education concentrating on 5 specific skills: -Communication; -Creative thinking; -Planning; -Problem solving and decision-making; -Financial literacy. This manual includes 45 learning activities to address topics related to diversity and sensitivity. The most important feature of these activities is that they are meant to be more challenging and provocative for the learners. A Diary of cultural dishes, a pirate battle of daily sensations and emotions, created during the youth exchange EuRoB.I.N. Food in Amsterdam 2018. 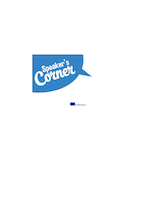 Written by a group of 30 participants from Netherlands, Spain, Greece, Portugal and Italy. This Handbook is a practical set of materials, resources, tools and methods, created for Youth Workers dealing with Newcomers (International students, migrants, refugees, asylum-seekers, displaced people, etc. ).